Did the United States Just Sell Out the Kurds? David Luce argues that the US has sold out the Kurds in order to sign up Turkey for the fight against the Islamic State; saying specifically that: “Washington may be allowing Ankara to batter the only forces on the ground that have proved effective against the Islamic State.” Is this an accurate observation? The answer is no. Turkey has not declared war on the Kurds. There are three major Kurdish political actors in the Middle East. The leftist Kurdish political party, the HDP, is now playing King-maker in Turkish electoral politics; the KRG, the de-facto independent state in northern Iraq that fields the peshmerga, the only force on the ground that (in combination with US air power) has proved effective against the Islamic State; and the PKK, a militant group now in control of some parts of northern Syria, that is also active inside Turkey. The Turkish government has launched an attack on the PKK in response to the killing of two police officers as well as a Turkish serviceman at the hands of the PKK. The suicide attack in which 32 people were killed and nearly 104 others were injured has been attributed to a man linked to ISIS: The Turks are just using the response to the ISIS attack as a cover for crushing the PKK. The HDP has called on the PKK to lay down its arms; a call echoed by the KRG which has offered its brokerage services to help relaunch the ceasefire between the Turkish government and the PKK. The Prime Minister of the KRG took a pot shot at the PKK for rejecting Mr. Abdullah Ocelan (who has also called on his comrades to lay down their arms) as a “principal party” in the peace negotiations. So the situation is much more complicated than simply the Turks crushing the Kurds. The KRG and the HDP, both worthy representatives of the Kurdish people, are not opposed to pushing the PKK back to the table with the application of force. The PKK would like to establish its own de-facto state in northern Syria; something along the lines of the KRG in northern Iraq. While Damascus poses even less of a hurdle to the PKK statelet than Baghdad does to the KRG, Turkey is unshakeably opposed to the PKK acquiring de-facto statehood without forswearing revolutionary aims inside Turkey. It is hard to see how even a coalition government that includes the HDP can be persuaded to accept a de-facto PKK state just south of the border without a peace deal with the PKK. The Turks could be persuaded to accept a PKK-run region south of the border only if the PKK permanently foreswore armed secession for the Kurds inside Turkish territory. The US green light to Turkey is to batter the PKK; not the Kurds. Nothing so far suggests that the Americans would accept a Turkish assault on the KRG; which has been under Anglo-American protection since 1991. The United States should of course be pushing the PKK and the Turkish government back to the table: The US needs the Turks and the Kurds to get along so that both can focus squarely on the Islamic State. If there were a referendum in the Kurdish areas in the Middle East (chunks of Turkey, Iran, Syria, and Iraq), the Kurds would overwhelmingly vote for an independent state. This ethnographic/democratic reality has been in play since the break-up of the Ottoman empire that brought Turkey into British arms, and Ottoman territories under joint French and British suzerainty. Turkey’s geostrategic position under Russia’s belly made it exceedingly useful as a platform for launching missiles and airstrikes into the Russian interior. The Mandate powers screwed over the Kurds from the get go, to keep their Turkish allies happy; a practice continued by the Americans after the Second World War on the same geostrategic grounds. 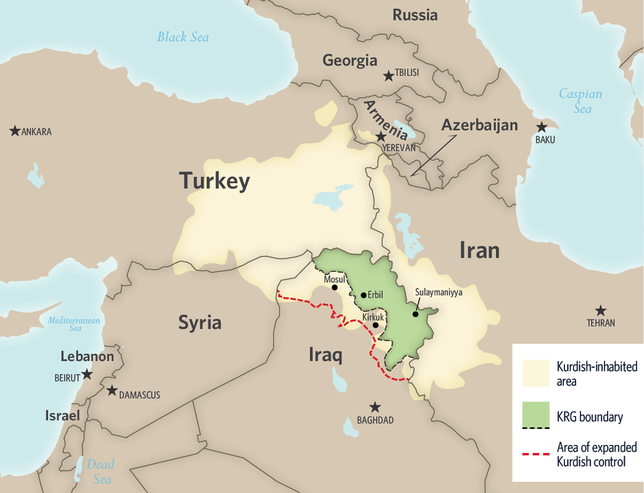 After kicking Saddam out of Kuwait in 1991, the Western allies imposed a no-fly zone in northern and southern Iraq; and helped the Kurds in northern Iraq establish a de-facto independent state, in what amounted to a partial reversal of a long-running policy. At first the Turks were furious. But after getting a measure of American resolve, got around to accepting the existence of the KRG. Once the KRG had established a working relationship with Turkey, it brokered a ceasefire between the PKK and the Turkish government in 2013. Recent events (mobilization in the Syrian conflict, especially the novel experience of American military support from the air) have emboldened the PKK, which is now seeking to replicate the achievement of the KRG in northern Syria. This is actually an achievable political goal for the PKK. But it needs to swallow the bitter pill and give up the fight for the liberation of the Kurds inside the borders of the Turkish state. It is too soon to tell the outcome of this convulsion. Much depends on backroom diplomacy. But it is clear than a stable working relationship between Turkey and the PKK statelet along the lines of the relationship that Turkey enjoys with the KRG is in Turkish and American interests. If Kerry can arrange it, he would arguably become one of the most successful Secretaries of State the US ever had.